If The Neutral Conductor opens, Break or Loose at either its source side (Distribution Transformer, Generator or at Load side (Distribution Panel of Consumer), the distribution system’s neutral conductor will “float” or lose its reference ground Point. The floating neutral condition can cause voltages to float to a maximum of its Phase volts RMS relative to ground, subjecting to its unbalancing load Condition. Floating Neutral conditions in the power network have different impact depending on the type of Supply, Type of installation and Load balancing in the Distribution. Broken Neutral or Loose Neutral would damage to the connected Load or Create hazardous Touch Voltage at equipment body. Here We are trying to understand the Floating Neutral Condition in T-T distribution System. If the Star Point of Unbalanced Load is not joined to the Star Point of its Power Source (Distribution Transformer or Generator) then Phase voltage do not remain same across each phase but its vary according to the Unbalanced of the load. As the Potential of such an isolated Star Point or Neutral Point is always changing and not fixed so it’s called Floating Neutral. On 3-phase systems there is a tendency for the star-point and Phases to want to ‘balance out’ based on the ratio of leakage on each Phase to Earth. The star-point will remain close to 0V depending on the distribution of the load and subsequent leakage (higher load on a phase usually means higher leakage). Three phases has properties that make it very desirable in electric power systems. Firstly the phase currents tend to cancel one another (summing to zero in the case of a linear balanced load). This makes it possible to eliminate the neutral conductor on some lines. Secondly power transfer into a linear balanced load is constant. Most domestic loads are single phase. Generally three phase power either does not enter domestic houses or it is split out at the main distribution board. Kirchhoff’s Current Law states that the signed sum of the currents entering a node is zero. If the neutral point is the node, then, in a balanced system, one phase matches the other two phases, resulting in no current through neutral. Any imbalance of Load will result in a current flow on neutral, so that the sum of zero is maintained. For instance, in a balanced system, current entering the neutral node from one Phase side is considered positive, and the current entering (actually leaving) the neutral node from the other side is considered negative. This gets more complicated in three phase power, because now we have to consider phase angle, but the concept is exactly the same. If we are connected in Star connection with a neutral, then the neutral conductor will have zero current on it only if the three phases have the same current on each. If we do vector analysis on this, adding up sin(x), sin(x+120), and sin(x+240), we get zero. The same thing happens when we are delta connected, without a neutral, but then the imbalance occurs out in the distribution system, beyond the service transformers, because the distribution system is generally a Star Connected. The neutral should never be connected to a ground except at the point at the service where the neutral is initially grounded (At Distribution Transformer). This can set up the ground as a path for current to travel back to the service. Any break in the ground path would then expose a voltage potential. Grounding the neutral in a 3 phase system helps stabilize phase voltages. A non-grounded neutral is sometimes referred to as a “floating neutral” and has a few limited applications. Power flows in and out of customers’ premises from the distribution network, entering via the Phase and leaving via the neutral. If there is a break in the neutral return path electricity may then travel by a different path. Power flow entering in one Phase returns through remaining two phases. Neutral Point is not at ground Level but it Float up to Line Voltage. This situation can be very dangerous and customers may suffer serious electric shocks if they touch something where electricity is present. Broken neutrals can be difficult to detect and in some instances may not be easily identified. Sometimes broken neutrals can be indicated by flickering lights or tingling taps. If you have flickering lights or tingly taps in your home, you may be at risk of serious injury or even death. A rule-of-thumb used by many in the industry is that Neutral to ground voltage of 2V or less at the receptacle is okay, while a few volts or more indicates overloading; 5V is seen as the upper limit. Low Reading: If Neutral to ground voltage is low at the receptacle than system is healthy, If It is high, then you still have to determine if the problem is mainly at the branch circuit level, or mainly at the panel level. Neutral to ground voltage exists because of the IR drop of the current traveling through the neutral back to the Neutral to ground bond. If the system is correctly wired, there should be no Neutral to Ground bond except at the source transformer (at what the NEC calls the source of the Separately Derived System, or SDS, which is usually a transformer). Under this situation, the ground conductor should have virtually no current and therefore no IR drop on it. In effect, the ground wire is available as a long test lead back to the Neutral to ground bond. High Reading: A high reading could indicate a shared branch neutral, i.e., a neutral shared between more than one branch circuits. This shared neutral simply increases the opportunities for overloading as well as for one circuit to affect another. Zero Reading: A certain amount of Neutral to ground voltage is normal in a loaded circuit. If the reading is stable at close to 0V. There is a suspect an illegal Neutral to ground bond in the receptacle (often due to lose strands of the neutral touching some ground point) or at the subpanel. Any Neutral to ground bonds other than those at the transformer source (and/or main panel) should be removed to prevent return currents flowing through the ground conductors. Neutral failure at transformer is mostly failure of Neutral bushing. The use of Line Tap on transformer bushing is identified as the main cause of Neutral conductor failure at transformer bushing. The Nut on Line Tap gets loose with time due to vibration and temperature difference resulting in hot connection. The conductor start melting and resulting broke off Neutral. Poor workmanship of Installation and technical staff also one of the reasons of Neutral Failure. A broken Neutral on Three phases Transformer will cause the voltage float up to line voltage depending upon the load balancing of the system. This type of Neutral Floating may damage the customer equipment connected to the Supply. Under normal condition current flow from Phase to Load to Load to back to the source (Distribution Transformer). When Neutral is broken current from Red Phase will go back to Blue or Yellow phase resulting Line to Line voltage between Loads. Some customer will experience over voltage while some will experience Low voltage. The impact of broken overhead Neutral conductor at LV overhead distribution will be similar to the broken at transformer. Supply voltage floating up to Line voltage instead of phase Voltage. This type of fault condition may damage customer equipment connected to the supply. A broken Neutral of service conductor will only result of loss of supply at the customer point. No any damages to customer equipments. Good Earthing Resistance of Earth Pit of Neutral provide low resistance path for neutral current to drain in earth. High Earthing Resistance may provide high resistance Path for grounding of Neutral at Distribution Transformer. Limit earth resistance sufficiently low to permit adequate fault current for the operation of protective devices in time and to reduce neutral shifting. Distribution Network Overloading combined with poor load distribution is one of the most reason of Neutral failure. Neutral should be properly designed so that minimum current will be flow in to neutral conductor. Theoretically the current flow in the Neutral is supposed to be zero because of cancellation due to 120 degree phase displacement of phase current. IN= IR<0 + IY<120 + IB<-120. In Overloaded Unbalancing Network lot of current will flow in Neutral which break Neutral at its weakest Point. From nonlinear loads, primarily third harmonic, will add up arithmetically and return on the neutral. In addition to being a potential safety problem because of overheating of an undersized neutral, the extra neutral current creates a higher Neutral to ground voltage. This Neutral to ground voltage subtracts from the Line to Neutral voltage available to the load. If you’re starting to feel that shared neutrals are one of the worst ideas that ever got translated to copper. Normally LV network are mostly not given attention by the Maintenance Staff. Loose or inadequate tightening of Neutral conductor will effect on continuity of Neutral which may cause floating of Neutral. Let us Take one Example to understand Neutral Floating Condition.We have a Transformer which Secondary is star connected, Phase to neutral = 240V and Phase to phase = 440V. Whether the Neutral is grounded the voltages remain the same 240V between phase & Neutral and 440V between phases. The Neutral is not Floating. All Appliances are connected: If the Neutral wire for a circuit becomes disconnected from the household’s main power supply panel while the Phase wire for the circuit still remains connected to the panel and the circuit has appliances plugged into the socket outlets. In that situation, if you put a voltage Tester with a neon lamp onto the Neutral wire it will glow just as if it was Live, because it is being fed with a very small current coming from the Phase supply via the plugged-in appliance(s) to the Neutral wire. All Appliances are Disconnected: If you unplug all appliances, lights and whatever else may be connected to the circuit, the Neutral will no longer seem to be Live because there is no longer any path from it to the Phase supply. Phase to Neutral Voltage: The meter indicates 110V AC to 330V AC. Neutral to Ground Voltage: The meter indicates 110V. Phase to Ground Voltage: The meter indicates 120V. This is because the neutral is “floats” above ground potential (110V + 120V = 230VAC). As a result the output is isolated from system ground and the full output of 230V is referenced between line and neutral with no ground connection. If suddenly disconnect the Neutral from the transformer Neutral but kept the loading circuits as they are, Then Load side Neutral becomes Floating since the equipment that are connected between Phase to Neutral will become between Phase to Phase ( R to Y,Y to B), and since they are not of the same ratings, the artificial resulting neutral will be floating, such that the voltages present at the different equipments will no longer be 240V but somewhere between 0 (not exactly) and the 440 V (also not exactly). Meaning that on one line Phase to Phase, some will have less than 240V and some will have higher up to near 415. All depends on the impedance of each connected item. In an unbalance system, if the neutral is disconnected from the source, the neutral becomes floating neutral and it is shifted to a position so that it is closer to the phase with higher loads and away from the phase with smaller load. Let us assume an unbalance 3 phase system has 3 KW load in R-phase, 2 KW load in Y-phase and 1 KW load in B-phase. If the neutral of this system is disconnected from the main, the floating neutral will be closer to R-phase and away from B-phase. So, the loads with B-phase will experience more voltage than usual, while the loads in R-phase will experience less voltage. Loads in Y-phase will experience almost same voltage. The neutral disconnect for an unbalanced system is dangerous to the loads. Because of the higher or lower voltages, the equipment is most likely to be damaged. There are Some Point needs to be consider to prevent of Neutral Floating. A floating neutral can be a serious problem. Suppose we have a breaker panel with 3 Pole Breaker for Three Phase and Bus bar for Neutral for 3 Phase inputs and a neutral (Here we have not used 4 Pole Breaker). The voltage between each Phase is 440 and the voltage between each Phase and the neutral is 230. We have single breakers feeding loads that require 230Volts. These 230Volt loads have one line fed by the breaker and a neutral. Now suppose the Neutral gets loose or oxidized or somehow disconnected in the panel or maybe even out where the power comes from. The 440Volt loads will be unaffected however the 230V loads can be in serious trouble. With this Floating neutral condition you will discover that one of the two lines will go from 230Volts up to 340 or 350 and the other line will go down to 110 or 120 volts. Half of your 230Volt equipment will go up in high due to overvoltage and the other half will not function due to a low voltage condition. So, be careful with floating neutrals. Simply use ELCB, RCBO or 4 Pole Circuit Breaker as income in the 3ph supply system since if neutral opens it will trip the complete supply without damaging to the system. 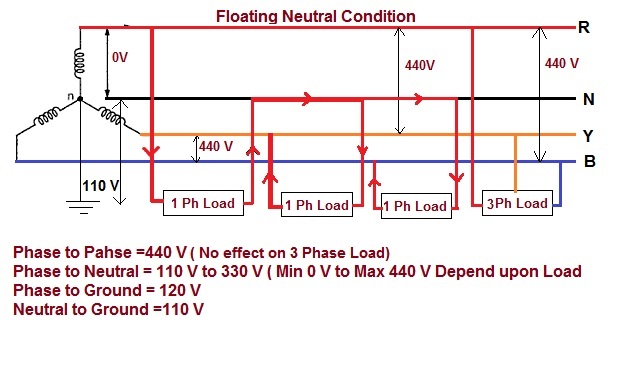 Whenever neutral fails in three phase system, the connected loads will get connected between phases owing to floating neutral. Hence depending on load resistance across these phases, the voltage keeps varying between 230V to 400V.A suitable servo stabilizer with wide input voltage range with high & low cutoff may help in protecting the equipments. A Floating Neutral (Disconnected Neutral) fault condition is VERY UNSAFE because If Appliance is not working and someone who does not know about the Neutral Floating could easily touch the Neutral wire to find out why appliances does not work when they are plugged into a circuit and get a bad shock. Single phase Appliances are design to work its normal Phase Voltage when they get Line Voltage Appliances may Damage .Disconnected Neutral fault is a very unsafe condition and should be corrected at the earliest possible by troubleshooting of the exact wires to check and then connect properly. For supplying a load in excess of the rating of an existing transformer, two or more transformers may be connected in parallel with the existing transformer. The transformers are connected in parallel when load on one of the transformers is more than its capacity. The reliability is increased with parallel operation than to have single larger unit. The cost associated with maintaining the spares is less when two transformers are connected in parallel. It is usually economical to install another transformer in parallel instead of replacing the existing transformer by a single larger unit. The cost of a spare unit in the case of two parallel transformers (of equal rating) is also lower than that of a single large transformer. In addition, it is preferable to have a parallel transformer for the reason of reliability. With this at least half the load can be supplied with one transformer out of service. For parallel connection of transformers, primary windings of the Transformers are connected to source bus-bars and secondary windings are connected to the load bus-bars. Same voltage Ratio & Turns Ratio (both primary and secondary Voltage Rating is same). Same Percentage Impedance and X/R ratio. Identical Position of Tap changer. Same Phase angle shift (vector group are same). Some of these conditions are convenient and some are mandatory. The convenient are: Same voltage Ratio & Turns Ratio, Same Percentage Impedance, Same KVA Rating, Same Position of Tap changer. The mandatory conditions are: Same Phase Angle Shift, Same Polarity, Same Phase Sequence and Same Frequency. When the convenient conditions are not met paralleled operation is possible but not optimal. If the transformers connected in parallel have slightly different voltage ratios, then due to the inequality of induced emfs in the secondary windings, a circulating current will flow in the loop formed by the secondary windings under the no-load condition, which may be much greater than the normal no-load current. The current will be quite high as the leakage impedance is low. When the secondary windings are loaded, this circulating current will tend to produce unequal loading on the two transformers, and it may not be possible to take the full load from this group of two parallel transformers (one of the transformers may get overloaded). If two transformers of different voltage ratio are connected in parallel with same primary supply voltage, there will be a difference in secondary voltages. Now when the secondary of these transformers are connected to same bus, there will be a circulating current between secondary’s and therefore between primaries also. As the internal impedance of transformer is small, a small voltage difference may cause sufficiently high circulating current causing unnecessary extra I2R loss. The ratings of both primaries and secondary’s should be identical. In other words, the transformers should have the same turn ratio i.e. transformation ratio. If two transformers connected in parallel with similar per-unit impedances they will mostly share the load in the ration of their KVA ratings. Here Load is mostly equal because it is possible to have two transformers with equal per-unit impedances but different X/R ratios. In this case the line current will be less than the sum of the transformer currents and the combined capacity will be reduced accordingly. A difference in the ratio of the reactance value to resistance value of the per unit impedance results in a different phase angle of the currents carried by the two paralleled transformers; one transformer will be working with a higher power factor and the other with a lower power factor than that of the combined output. Hence, the real power will not be proportionally shared by the transformers. The current shared by two transformers running in parallel should be proportional to their MVA ratings. The current carried by these transformers are inversely proportional to their internal impedance. From the above two statements it can be said that impedance of transformers running in parallel are inversely proportional to their MVA ratings. In other words percentage impedance or per unit values of impedance should be identical for all the transformers run in parallel. When connecting single-phase transformers in three-phase banks, proper impedance matching becomes even more critical. In addition to following the three rules for parallel operation, it is also a good practice to try to match the X/R ratios of the three series impedances to keep the three-phase output voltages balanced. Lets examine following different type of case among Impedance, Ratio and KVA. If single-phase transformers are connected in a Y-Y bank with an isolated neutral, then the magnetizing impedance should also be equal on an ohmic basis. Otherwise, the transformer having the largest magnetizing impedance will have a highest percentage of exciting voltage, increasing the core losses of that transformer and possibly driving its core into saturation. The standard method of connecting transformers in parallel is to have the same turn ratios, percent impedances, and kVA ratings. Connecting transformers in parallel with the same parameters results in equal load sharing and no circulating currents in the transformer windings. Example: Connecting two 2000 kVA, 5.75% impedance transformers in parallel, each with the same turn ratios to a 4000 kVA load. kVA1 = 348 / (348 + 348) x 4000 kVA = 2000 kVA. This Parameter is not in common practice for new installations, sometimes two transformers with different kVAs and the same percent impedances are connected to one common bus. In this situation, the current division causes each transformer to carry its rated load. There will be no circulating currents because the voltages (turn ratios) are the same. Example: Connecting 3000 kVA and 1000 kVA transformers in parallel, each with 5.75% impedance, each with the same turn ratios, connected to a common 4000 kVA load. From above calculation it is seen that different kVA ratings on transformers connected to one common load, that current division causes each transformer to only be loaded to its kVA rating. The key here is that the percent impedance are the same. Mostly used this Parameter to enhance plant power capacity by connecting existing transformers in parallel that have the same kVA rating, but with different percent impedances. This is common when budget constraints limit the purchase of a new transformer with the same parameters. We need to understand is that the current divides in inverse proportions to the impedances, and larger current flows through the smaller impedance. Thus, the lower percent impedance transformer can be overloaded when subjected to heavy loading while the other higher percent impedance transformer will be lightly loaded. Example: Two 2000 kVA transformers in parallel, one with 5.75% impedance and the other with 4% impedance, each with the same turn ratios, connected to a common 3500 kVA load. It can be seen that because transformer percent impedances do not match, they cannot be loaded to their combined kVA rating. Load division between the transformers is not equal. At below combined rated kVA loading, the 4% impedance transformer is overloaded by 3.2%, while the 5.75% impedance transformer is loaded by 72%. This particular of transformers used rarely in industrial and commercial facilities connected to one common bus with different kVA and unequal percent impedances. However, there may be that one situation where two single-ended substations may be tied together via bussing or cables to provide better voltage support when starting large Load. If the percent impedance and kVA ratings are different, care should be taken when loading these transformers. Example: Two transformers in parallel with one 3000 kVA (kVA1) with 5.75% impedance, and the other a 1000 kVA (kVA2) with 4% impedance, each with the same turn ratios, connected to a common 3500 kVA load. Because the percent impedance is less in the 1000 kVA transformer, it is overloaded with a less than combined rated load. Small differences in voltage cause a large amount of current to circulate. It is important to point out that paralleled transformers should always be on the same tap connection. Circulating current is completely independent of the load and load division. If transformers are fully loaded there will be a considerable amount of overheating due to circulating currents. The Point which should be Remember that circulating currents do not flow on the line, they cannot be measured if monitoring equipment is upstream or downstream of the common connection points. Circulating current %IC = %eX100 / √ (%R1+k%R2)2 + (%Z1+k%Z2)2. The circulating current is 21.7% of the full load current. This type of parameter would be unlikely in practice. If both the ratios and the impedance are different, the circulating current (because of the unequal ratio) should be combined with each transformer’s share of the load current to obtain the actual total current in each unit. For unity power factor, 10% circulating current (due to unequal turn ratios) results in only half percent to the total current. At lower power factors, the circulating current will change dramatically. Example: Two transformers connected in parallel, 2000 kVA1 with 5.75% impedance, X/R ratio of 8, 1000 kVA2 with 4% impedance, X/R ratio of 5, 2000 kVA1 with tap adjusted 2.5% from nominal and 1000 kVA2 tapped at nominal. %IC = 250 / 13.73 = 18.21. The circulating current is 18.21% of the full load current. Polarity of transformer means the instantaneous direction of induced emf in secondary. If the instantaneous directions of induced secondary emf in two transformers are opposite to each other when same input power is fed to the both of the transformers, the transformers are said to be in opposite polarity. The transformers should be properly connected with regard to their polarity. If they are connected with incorrect polarities then the two emfs, induced in the secondary windings which are in parallel, will act together in the local secondary circuit and produce a short circuit. Polarity of all transformers run in parallel should be same otherwise huge circulating current flows in the transformer but no load will be fed from these transformers. If the instantaneous directions of induced secondary emf in two transformers are same when same input power is fed to the both of the transformers, the transformers are said to be in same polarity. The phase sequence of line voltages of both the transformers must be identical for parallel operation of three-phase transformers. If the phase sequence is an incorrect, in every cycle each pair of phases will get short-circuited. This condition must be strictly followed for parallel operation of transformers. The transformer windings can be connected in a variety of ways which produce different magnitudes and phase displacements of the secondary voltage. All the transformer connections can be classified into distinct vector groups. In order to have zero relative phase displacement of secondary side line voltages, the transformers belonging to the same group can be paralleled. For example, two transformers with Yd1 and Dy1 connections can be paralleled. The transformers of groups 1 and 2 can only be paralleled with transformers of their own group. However, the transformers of groups 3 and 4 can be paralleled by reversing the phase sequence of one of them. For example, a transformer with Yd1 1 connection (group 4) can be paralleled with that having Dy1 connection (group 3) by reversing the phase sequence of both primary and secondary terminals of the Dy1 transformer. We can only parallel Dy1 and Dy11 by crossing two incoming phases and the same two outgoing phases on one of the transformers, so if we have a DY11 transformer we can cross B&C phases on the primary and secondary to change the +30 degree phase shift into a -30 degree shift which will parallel with the Dy1, assuming all the other points above are satisfied. Transformers of unequal kVA ratings will share a load practically (but not exactly) in proportion to their ratings, providing that the voltage ratios are identical and the percentage impedances (at their own kVA rating) are identical, or very nearly so in these cases a total of than 90% of the sum of the two ratings is normally available. It is recommended that transformers, the kVA ratings of which differ by more than 2:1, should not be operated permanently in parallel. Transformers having different kva ratings may operate in parallel, with load division such that each transformer carries its proportionate share of the total load To achieve accurate load division, it is necessary that the transformers be wound with the same turns ratio, and that the percent impedance of all transformers be equal, when each percentage is expressed on the kva base of its respective transformer. It is also necessary that the ratio of resistance to reactance in all transformers be equal. For satisfactory operation the circulating current for any combinations of ratios and impedances probably should not exceed ten percent of the full-load rated current of the smaller unit. The only important point to be remembered is the tap changing switches must be at same position for all the three transformers and should check and confirm that the secondary voltages are same. When the voltage tap need change all three tap changing switches should be operated identical for all transformers. The OL settings of the SF6 also should be identical. If the substation is operating on full load condition, tripping of one transformer can cause cascade tripping of all three transformers. In transformers Output Voltage can be controlled either by Off Circuit Tap Changer (Manual tap changing) or By On – Load Tap Changer-OLTC (Automatic Changing). (1) AVR (Automatic Voltage Regulator- an electronic programmable device). With this AVR we can set the Output Voltage of the transformers. The Output Voltage of the transformer is fed into the AVR through the LT Panel. The AVR Compares the SET voltage & the Output Voltage and gives the error signals, if any, to the OLTC through the RTCC Panel for tap changing. This AVR is mounted in the RTCC. (2) RTCC (Remote Tap Changing Cubicle): This is a panel consisting of the AVR, Display for Tap Position, Voltage, and LEDs for Raise & Lower of Taps relays, Selector Switches for Auto Manual Selection… In AUTO MODE the voltage is controlled by the AVR. In manual Mode the operator can Increase / decrease the voltage by changing the Taps manually through the Push Button in the RTCC. (3) OLTC is mounted on the transformer. It consists of a motor, controlled by the RTCC, which changes the Taps in the transformers. Both the Transformers should have same voltage ratio at all the taps & when you run transformers in parallel, it should operate as same tap position. If we have OLTC with RTCC panel, one RTCC should work as master & other should work as follower to maintain same tap positions of Transformer. However, a circulating current can be flown between the two tanks if the impedances of the two transformers are different or if the taps of the on-load tap changer (OLTC) are mismatched temporarily due to the mechanical delay. The circulating current may cause the malfunction of protection relays. All parallel units must be supplied from the same network. Secondary cabling from the transformers to the point of paralling has approximately equal length and characteristics. When the transformers are operated in parallel, the fault current would be very high on the secondary side. Supposing percentage impedance of one transformer is say 6.25 %, the short circuit MVA would be 25.6 MVA and short circuit current would be 35 kA. If the transformers are of same rating and same percentage impedance, then the downstream short circuit current would be 3 times (since 3 transformers are in Parallel) approximately 105 kA. This means all the devices like ACBs, MCCBs, switch boards should withstand the short-circuit current of 105 kA. This is the maximum current. This current will get reduced depending on the location of the switch boards, cables and cable length etc. However this aspect has to be taken into consideration. There should be Directional relays on the secondary side of the transformers. The percent impedance of one transformer must be between 92.5% and 107.5% of the other. Otherwise, circulating currents between the two transformers would be excessive. Following Vector group of Transformer will operate in parallel. Single-phase transformers can be connected to form 3-phase transformer banks for 3-phase Power systems. Four common methods of connecting three transformers for 3-phase circuits are Δ-Δ, Y-Y, Y-Δ, and Δ-Y connections. An advantage of Δ-Δ connection is that if one of the transformers fails or is removed from the circuit, the remaining two can operate in the open-Δ or V connection. This way, the bank still delivers 3-phase currents and voltages in their correct phase relationship. However, the capacity of the bank is reduced to 57.7 % (1 3) of its original value. In the Y-Y connection, only 57.7% of the line voltage is applied to each winding but full line current flows in each winding. The Y-Y connection is rarely used. The Δ-Y connection is used for stepping up voltages since the voltage is increased by the transformer ratio multiplied by 3. Following Vector group of Transformer will not operate in parallel. Checked by synchronizing relay & synchro scope. If Secondary of Transformer is not LT Then we must use check synchronizing relay & Commission the system properly. After connecting relay. Relay must be charges with only 1 supply & check that relay is functioning properly. Synchronizing should be checked of both the supply voltages. This can be checked directly with millimeter between L1 phases of Transformer 1 and L1 phase of Transformer 2. Then L2 Phase of Transformer 1 and L2 Phase of Transformer 2. Then L3 Phase of Transformer 1 and L3 Phase of Transformer 2. In all the cases MultiMate should show 0 voltages theoretically. These checks must be done at synchronizing breakers only. We have to also check that breaker out going terminals are connected in such a way that L1 Terminals of both the Breakers comes to same Main Bus bar of panel. Same for L2 & L3. Best way to check synchronization on LT is charge complete panel with 1 source up to outgoing terminals of another incoming breaker terminal. Then just measure Voltage difference on Incoming & out going terminals of Incoming Breaker. It should be near to 0. To check circulating current Synchronize both the transformer without outgoing load. Then check current. It will give you circulating current. Generally electrical power transformer gives the maximum efficiency at full load. If we run numbers of transformers in parallel, we can switch on only those transformers which will give the total demand by running nearer to its full load rating for that time. When load increases we can switch no one by one other transformer connected in parallel to fulfil the total demand. In this way we can run the system with maximum efficiency. If numbers of transformers run in parallel we can take shutdown any one of them for maintenance purpose. Other parallel transformers in system will serve the load without total interruption of power. If nay one of the transformers run in parallel, is tripped due to fault other parallel transformers is the system will share the load hence power supply may not be interrupted if the shared loads do not make other transformers over loaded. There is a chance of increasing or decreasing future demand of power system. If it is predicted that power demand will be increased in future, there must be a provision of connecting transformers in system in parallel to fulfil the extra demand because it is not economical from business point of view to install a bigger rated single transformer by forecasting the increased future demand as it is unnecessary investment of money. Again if future demand is decreased, transformers running in parallel can be removed from system to balance the capital investment and its return. Increasing short-circuit currents that increase necessary breaker capacity. The risk of circulating currents running from one transformer to another Transformer. Circulating currents that diminish load capability and increased losses. The bus ratings could be too high. Paralleling transformers reduces the transformer impedance significantly, i.e. the parallel transformers may have very low impedance, which creates the high short circuit currents. The control and protection of three units in parallel is more complex. It is not a common practice in this industry, since Main-tie-Main is very common in this industry. Loading considerations for paralleling transformers are simple unless kVA, percent impedances, or ratios are different. When paralleled transformer turn ratios and percent impedances are the same, equal load division will exist on each transformer. When paralleled transformer kVA ratings are the same, but the percent impedances are different, then unequal load division will occur. The same is true for unequal percent impedances and unequal kVA. Circulating currents only exist if the turn ratios do not match on each transformer. The magnitude of the circulating currents will also depend on the X/R ratios of the transformers. Delta-delta to delta-wye transformer paralleling should not be attempted. Say, M.G. The performance and design of alternating current machines. Application Guide, Loading of Transformer, Nashville, TN, USA. Toro, V.D. Principles of electrical engineering. Stevenson, W.D. Elements of power system analysis. MIT Press, Magnetic circuits and transformers, John Wiley and Sons.